Every Tuesday, Italian expat Emiko Davies is taking us on a grand tour of Italy, showing us how to make classic, fiercely regional dishes at home. Today: A classic dish from Abruzzo, named after the guitar-like instrument used to make it. A symbol of the cuisine of Abruzzo, spaghetti alla chitarra (“guitar spaghetti”) are also known in Abruzzo's dialect as maccarune, or maccheroni alla chitarra. 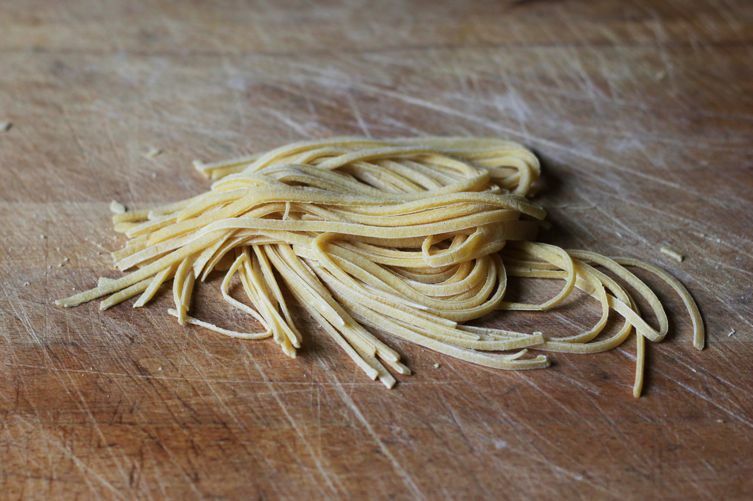 Although maccheroni are usually thought of as a short pasta to English speakers, in this case we are talking long noodles, similar to spaghetti or linguine, but square-sided. And the reference to the guitar? 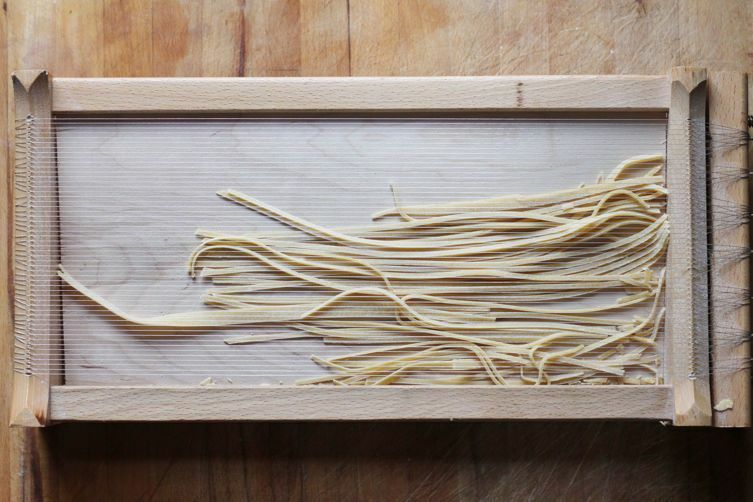 It comes from the traditional tool (known as a "carrature" in dialect) used to make these noodles -- a large, rectangular wooden frame, with numerous thin wires stretched across the long side, that looks rather like a stringed instrument. 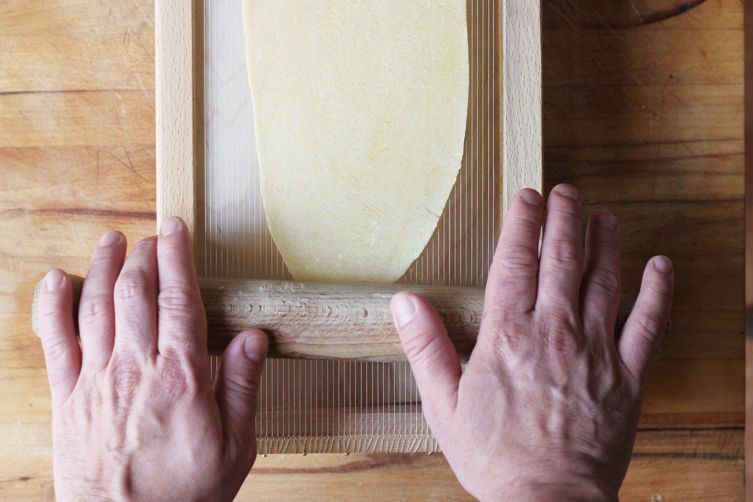 The pasta dough, made of flour (or semolina) and eggs, is rolled into a not-too-thin, long, rectangular sheet and then placed on top of the “guitar” frame. 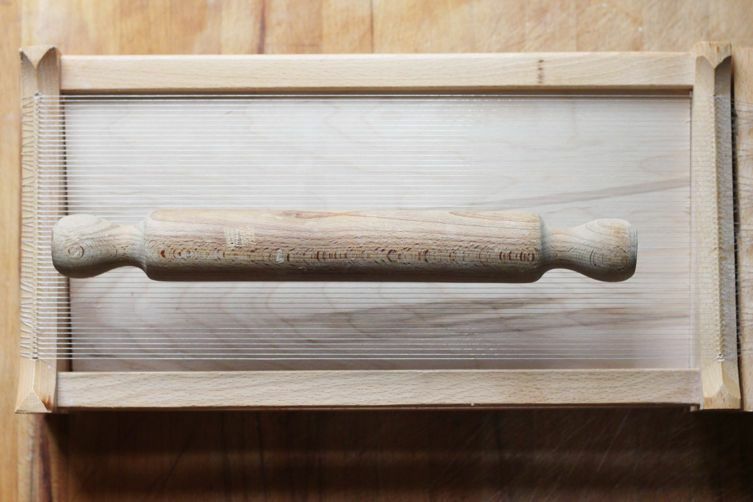 A rolling pin is then pushed over the top, forcing the pasta sheet through the wires, which cut the pasta into perfectly shaped noodles. If any of the pasta is left hanging on to the guitar, a simple strum across the wires with a finger helps to loosen them. If you don't have one of these Abruzzese "guitars," then you can make do by arming yourself with a sharp knife and some precision cutting. Fold the well-floured pasta sheets lengthwise until it's about the size of the width of your palm, then slice away -- you want noodles about 1/8-inch thick. Or if you have a pasta rolling machine, you can use the regular spaghetti attachment. Unsurprisingly, it's a preparation that, like the device, dates back to the Middle Ages. Age-old versions of this pasta included highly prized saffron in the pasta dough, infused in the egg before mixing with flour. In fact, the local saffron from Aquila is famous in Italy and is featured in many of the region's dishes, particularly with pasta or potatoes. Unlike other fresh egg pastas, which are usually cooked to reveal a more tender and silkier side, spaghetti alla chitarra calls for a bit of bite to it (that is, al dente) to carry the hearty, rich sauces it usually accompanies -- chunky ragu, particularly made from young lamb, a staple in Abruzzo's cuisine, or, like this one below, a trilogy of diced pork, veal, and lamb. Vegetarians might like their spaghetti alla chitarra with a punchy sauce made of red peppers. Like many ragu recipes, there are as many variations of the classic Abruzzese ragu as households. 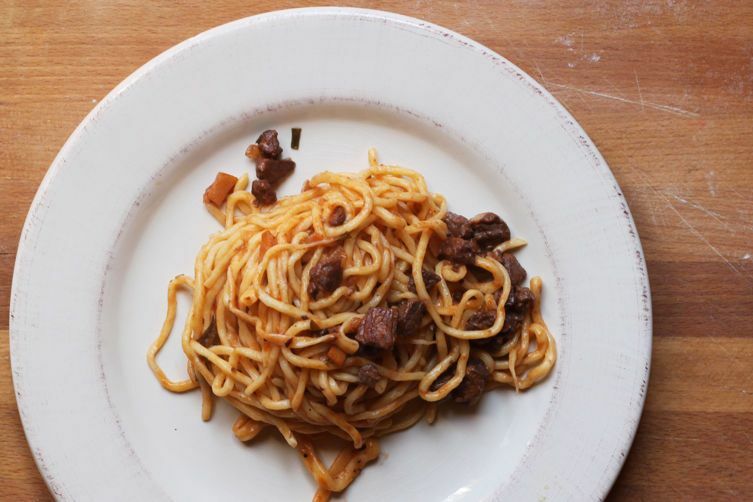 Some hold back on the wine or guanciale, keeping it simple: onion, meat, and tomato. Some like to add dried red chile pepper flakes for a touch of spice, or a bit of rosemary. Some stir the Pecorino through the sauce before serving, rather than sprinkle it on top. Either way, abundant Pecorino cheese is always welcomed, as is a glass of Montepulciano d'Abruzzo. The Australian-Japanese cookbook author has lived in Florence (where a visit to a cheese farm once inspired her to start a food blog) for over 10 years with her Tuscan sommelier husband. Her second cookbook Acquacotta: Recipes and Stories from Tuscany's Secret Silver Coast (Hardie Grant Books), is out now. When I was 14, I spent the entire summer with my Grandparents in their home town of Sulmona, Italy, which is in Abruzzi. We stayed with my Grandfather's sister, and she made all of her spaghetti on a chitarra that was hand made for her by her husband. I'll never forget my fascination with that, and I remember quizzing my Grandmother on why she didn't use one in her home in Pittsburgh. Of course, she didn't need one, having a fancy hand cranked pasta maker at home. But still....this is a beautiful example of a local traditional tool that continues to live on. Thanks for posting this! Hand made carrature! Wow. And a beautiful food memory, thanks for sharing.